For the perfect application of your tire gel or dressing! Speed Master Tire Dressing Applicator is an open-cell foam applicator designed to apply an even and complete layer of your chosen tire gel or dressing. Manufactured with a soft foam design bottom and a thicker red handle, the Speed Master Tire Dressing Applicator has grooved lines on the applicator side that channel your product evenly onto the surface. The soft foam molds itself to the surface of your tire, preventing dripping and excess product being wasted. 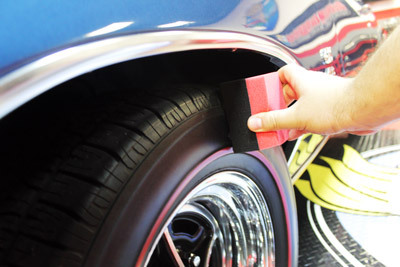 Speed Master Tire Dressing Applicator provides a perfect, even finish on your tire every time! Tire gels and dressing make your tires look crisp, new, and freshly detailed, but are some of the messiest products to work with. Due to their lower viscosity level, they drip more freely and can quickly become an unmanageable mess. Their fluidity can also lead to an uneven, blotchy appearance, if not applied correctly. The trick to a perfect tire dressing or gel application is your applicator – and the Speed Master Tire Dressing Applicator is perfect! The Speed Master Tire Applicator features a firm foam handle for a strong grip, as well as a grooved foam applicator side for perfect application! Made of an open-cell foam, the Speed Master Tire Dressing Applicator soaks up just enough product and doles it out evenly along the surface. 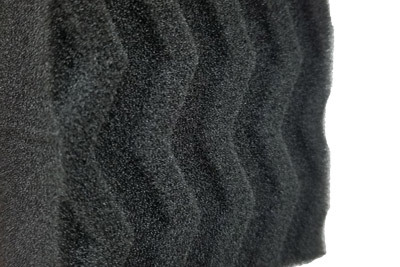 Diagonal grooves in the foam provide a smooth channel for your products to prevent over-application. Designed with a built-in “handle” that allows for a strong grip, the Speed Master Tire Dressing Applicator keeps your hands clean during your tire detail! The Speed Master Tire Dressing Applicator’s soft foam also allows for perfect application of trim dressings and sealants on plastic surfaces as well as tire dressings and gels. The Speed Master Tire Dressing Applicator creates the perfect, even layer of dressing (and keeps your hands clean! ), and is a necessity when detailing!